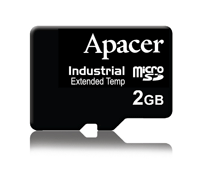 Apacer’s industrial-grade MicroSD memory card is compliant with SD 2.0 Specification. Available in 256MB to 4GB with sequential read/write speed reaching up to 20/16 MB/sec, it fulfills requirements for flexible-capacity and high-speed data storage. Compatible with the latest SD3.0 interface, the Apacer R1-series microSD memory cards are available in capacities of 1 to 8GB despite their small form factor and demonstrate excellent performance while consuming little power. 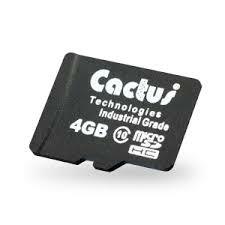 Cactus Technologies Industrial Grade microSD Card is a small form factor, highly reliable, high endurance flash storage device which conforms to the SD Associations microSD specifications. It is designed with the highest quality SLC NAND for applications which demand data integrity and 100% uptime. 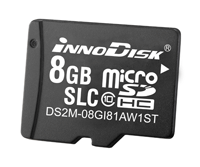 The Innodisk Industrial microSD card is a tiny, SLC-based storage solution designed for ruggedized embedded applications. This industrial-grade device delivers data transfer reliably and provides excellent long-lasting performance.